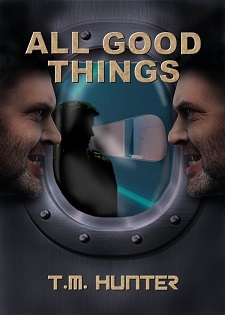 After taking a week off for my annual pilgrimage to Dallas for ConDFW, I'm back in the saddle again for another snippet from my new Aston West "series" novel, All Good Things. If you didn't already realize it, the new novel is now fully available over at Amazon (in print and e-book) through the link above. I'll continue posting snippets for the next several weeks. I turned my head this way and that, trying to catch a glimpse of my nemesis. Then he stepped out of the corner shadows between us and the doorway, a disintegrator cannon in his hands. “No...” I muttered beneath my breath. The minimal light from the main corridor illuminated him like an angel, which I knew for certain he wasn’t. He hadn’t changed in appearance at all, wearing that same baggy white shirt buttoned halfway up his chest which did little to hide his muscular chest. Bristly blonde stubble adorned the top of his head. His face was hard and unmoving, as if chiseled in stone. A pair of tan pants and dark brown boots made him look like an extra in an old medieval holo-movie. They didn’t use disintegrator cannons in those, though. “It’s been too long,” he muttered. Rione was understandably confused. “Aston?” She hadn’t known Elijah Cassus, and given my choice, I would have kept it that way. Apparently, fate had other plans.